Virtue is among the most venerable concepts in philosophy, and has recently seen a major revival. However, new challenges to conceptions of virtue have also arisen. In Current Controversies in Virtue Theory, five pairs of cutting-edge philosophers square off over central topics in virtue theory: the nature of virtue, the connection between virtue and flourishing, the connection between moral and epistemic virtues, the way in which virtues are acquired, and the possibility of attaining virtue. Mark Alfano guides his readers through these essays (all published here for the first time), with a synthetic introduction, succinct abstracts of each debate, suggested further readings and study questions for each controversy, and a list of further controversies to be explored. Mark Alfano is Assistant Professor of Philosophy at the University of Oregon. He specializes in moral psychology broadly construed, including virtue theory, decision making, ethics, and experimental philosophy. His first book was Character as Moral Fiction (2013). He has also participated in a number of interdisciplinary projects, including a quarter-million-dollar investigation of the nature, causes of, and consequences of intellectual humility. "This offers an excellent introduction to five contemporary issues in the theory of virtue: What is a virtue? Does virtue contribute to flourishing? How are ethical and epistemic virtues related? How are virtues acquired? and Can people be virtuous? Each issue is discussed and debated by two distinguished authors. The discussion throughout is very clear and worth reading. The book as a whole will be useful to students in an introductory moral philosophy course as well as being good reading for anyone else interested in moral virtues or ethics more generally." "Virtue is now a concept not only familiar but widely discussed in ethics and epistemology. 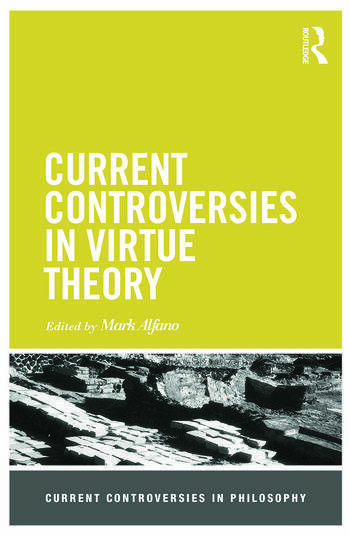 This volume introduces debates between philosophers on basic issues in virtue theory. They are explored in depth and in relation to the many options now available in both fields. Can I become virtuous, and if so, how? Does becoming ethically virtuous give me an epistemic advantage? How is being virtuous related to having aims that are good? In five debates between leading philosophers in the fields, these and other provoking and enticing issues are discussed in a lively and engaging way."